Following President Trump’s 2017 Executive Order that instructed the Departments of Health and Human Services, Labor, and the Treasury to consider revisions to existing policies for short-term health insurance, a newly proposed rule promises to change the maximum coverage duration. 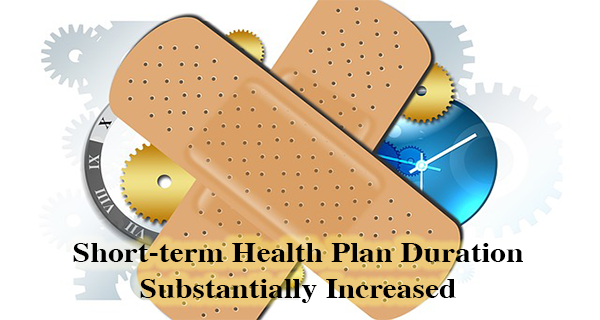 Currently, the maximum duration for short-term health insurance plans is for periods less than three months. The new proposal would increase the maximum duration for this temporary coverage to periods of less than 12 months, allowing more time to transition to a standard health care plan or an alternative health care solution. Short-term health plans, exempt from Affordable Care Act (ACA) provisions, are intended to provide coverage when an individual is in transition from one plan type to another plan type. They are often the only option some people have outside of the 6-week open enrollment period that starts in November. The newly proposed rule also includes an awareness initiative designed to help consumers understand policy coverage and a requirement for a notice to consumers stating the selected short-term health plan is not required to comply with the ACA provisions that apply to standard health care plans. Data collected from Centers for Medicare & Medicaid Services (CMS) Multidimensional Information and Data Analytics System (Midas) and other sources show a 105% increase in marketplace premiums when comparing individual 2013 premiums to 2017 premiums in 39 states using Healthcare.gov. Average monthly premiums more than doubled, adding $254 per month. Additionally, half of U.S. counties were limited to a single carrier choice, also limiting the options for consumers in those areas seeking relief from rising health plan rates. Short-term health plan coverage, generally with lower premiums than ACA-compliant plans, provides an affordable bridge to a standard health insurance plan or an ACA-exempt alternative. Data from 2016 placed average short-term plan costs at $124 per month compared to $393 for an unsubsidized ACA-compliant plan . Government officials project that an additional 100,000 to 200,000 individuals would opt for short-term plans from ACA market plans by 2019.
Who Benefits From the Proposed Change? The proposal could fill a potential gap in coverage for those who become seriously ill while covered by a short-term plan limited to a duration of three months or fewer. In such cases, consumers would be unlikely to qualify for a new short-term plan and would be without coverage until the next enrollment. The proposed change is open for comments until April 23, 2018, and open for review at the Federal Register.